An unhinged homeless man befriends a teenage drug dealer. Oliver has a lot of issues. He blames the government for his homelessness. While living on the streets of Dublin, he has become religious, thanks to his imaginary pastor and mentor, whom he goes to deadly lengths to appease. He stalks women. And he has just made a new friend in teenage drug dealer, Tommy. Yes, Oliver has a lot of issues, but all of which add up to a genuinely unhinged film that feels like a vicious cocktail of Hobo with a Shotgun and Taxi Driver, with a twist of Silent Night Deadly Night. The film starts off simply, with a pastor preaching to the people walking by on the street, when he grabs the attention of Oliver. From there, it’s clear that Oliver is hooked and will do anything to please his new idol. 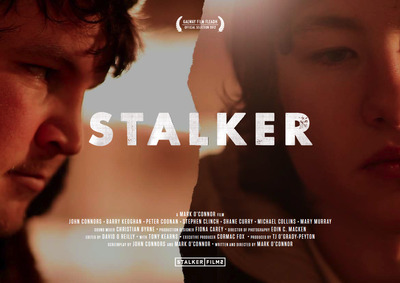 Oliver then meets and befriends a teenage boy named Tommy, who is a low level drug dealer, and spends the film getting run down and cussed at by everyone in his life… everyone, except of course, his new stalker, Oliver. As the two interact with each other, people are rightly concerned about their friendship, but as they obviously don’t care for Tommy, I oddly found myself rooting for the friendship to work out. Instead, the climax of the film becomes a bloodbath that I didn’t think this film had in it. The film looks fine, never particularly great, but definitely no complaints here about shaky camera work, weird angles, or distracting movements. The actors overact at times, but it’s nothing too distracting because, in actuality, it lends the film an extra flair of entertainment. Personally, I loved that every time Oliver was about to lose his cool, we would see the situation from his angle, but everything would have a blood red tint to it, almost like he was a shark and the blood in the water was his trigger to take care of the wrong doers in the streets of Dublin. There are a few surprisingly deep quips about government and about the state of humanity, and the gleefully themed music throughout the film is a hauntingly cool way to convey that the filmmakers are not taking things too seriously and are having a blast with the character and his psychotic outbursts. Having said all of these things, the film is not great. The overacting, while fitting the film greatly, is a particular taste that I know a lot of people do not like. I do, because I love movies that are so bad they’re good, which I would say this definitely is. Stalker is not The Room or Troll 2 bad, but as I mentioned earlier, its quality is on par with Hobo With a Shotgun and Silent Night Deadly Night throughout most of the film. It’s once you get to the climax that the film takes a turn into a finale of carnage that is reminiscent, but nowhere near equal to that, of Taxi Driver, and ends all too suddenly on a particularly gruesome note. Films like this that are so bad they’re good are an acquired taste that few have. If you do, you will enjoy this one.